Clamp-Swing is a market leader in developing innovative retail merchandising products, primarily for the supermarket industry. In addition to our diverse lines of Price Tag Systems for fresh foods, here are a few of our other merchandising products. 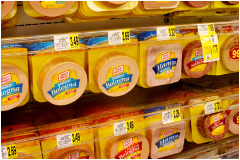 Our patented SpaceSaver® II Baffle System for hanging refrigerated products, creates an attractive display, saves energy and reduces shrink by ensuring good air flow in the case. Clear Card Holders and View-Lok Adaptors® position your P-O-P signs at a perfect viewing angle. U-Clips, with full swivel capabilities, are made for hard to sign locations. 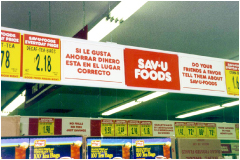 The Skyline Hanging Sign System is ideal for limited assortment stores that want a low cost solution for a uniform overhead display. 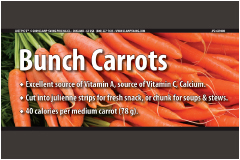 Combining our Fresh Facts© nutrition information with brilliant photographic images, our new stock produce signage will make your department spring to life. 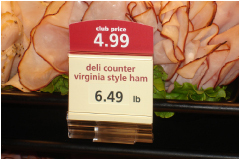 The unique Just Pic’d graphics add sparkling color and provides valuable information to help you merchandise to an ever-changing population that is increasingly concerned about the fresh foods they eat. Hundreds of different fruits and vegetables are depicted for products regularly offered in your stores. 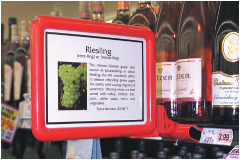 The system has been designed to allow you to customize your display, quickly and inexpensively. Merchandise the latest products with full color graphics, professionally printed on durable plastic materials. 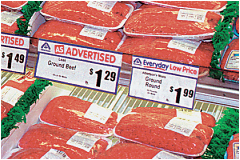 The system uses folded number panels for easy price changes and is complete with Country of Origin inserts (COOL) and Slogan Panels to promote your key messages. The components and tracks are compatible with most of the 6-track systems in use today. They can be attached to all common fixtures including Single and Multi-Deck Canopy Cases, Island and Euro Tables and Orchard Bins. In addition, small holders can be placed adjacent to specialty items and our industry-leading FrameWorks© will promote your featured displays. Choose from traditional plastic embossed price tags, write-on/wipe-off tags, or dial tags to contemporary cover tags with our patented 4-way price points or extruded track / channel sign holders with folded panels or price points. For hot food deli cases, we feature our new stainless steel pan clip with extruded aluminum or plastic sign holders or plastic sleeves. 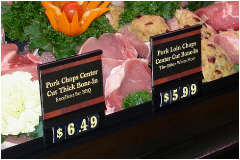 We can provide durable plastic sign kits with cover tags and price points or you can use your in-store printed paper signs with our tag holders. We make a full range of attachments such as pins, pan clips, moulding clamps, easel bases or U-Clips. 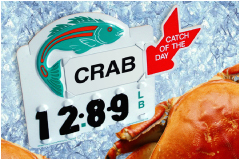 They will enable you to display your price signs, be they paper or plastic, exactly where you want them. 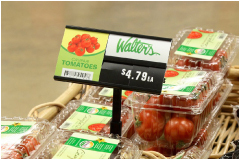 Our produce sign systems featuring our MonoRail tracks and Just Pic’d photographic tags will brighten up any produce or floral department. Custom printing of these and other point of purchase signage is what we do best. We use offset and digital printing presses and our capabilities include variable data printing, hot press laminating, die cutting, UV coating and many other secondary processes. Our upscale FrameWorks© are handsomely designed for maximum sales impact and are made from engineering grade plastics for maximum durability. The unique features that are incorporated into our patented modular plastic sign frames allows you to change the configuration of the assembly in the field from an easel base frame to a round weighted base model, add or remove an adjustable stem, use an angle adaptor to tilt the sign for better viewing or change from a portrait to landscape display. Our patented telescoping stems, now available in two sizes, has detents every half inch to enable you to quickly set several frames to the same height. Our patented side-view frame features a flexible hinge so it will stay in the shelf if it gets hit. Other adaptors for front-view end cap displays, wall mount, slatwall, hanging or magnet applications are also available. Stocked in black, white and red with frames to accommodate the most common paper sign sizes, including 8-1/2” x 11”.